And by aggressive, I mean going from My Little Pony to Care Bears levels of rate hawkishness. 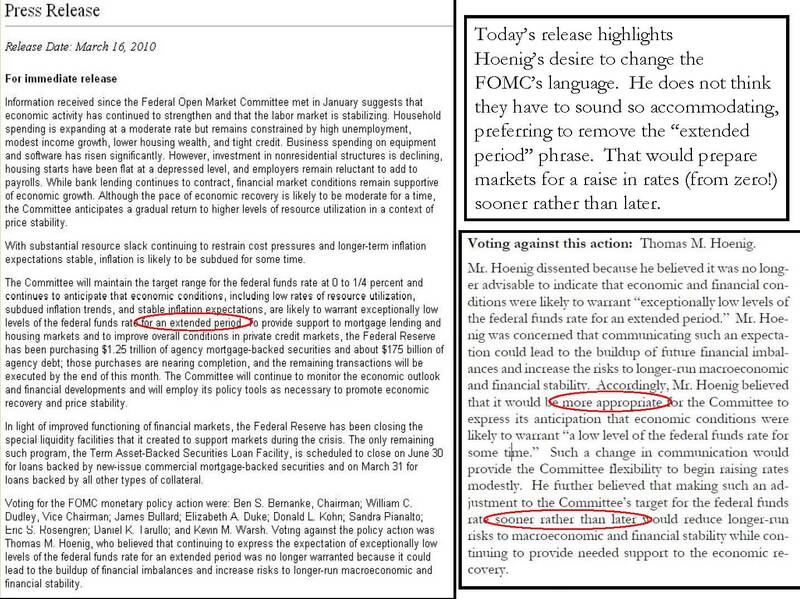 As we know, the FOMC decision in March left the term "extended period" in there, meaning we were at least a few meetings away from a rate hike, or even a warning of a rate hike. In today's meeting minutes (the minutes form the March meeting), the last page highlights the one dissenter's view on how the language should be changed. Thomas Hoenig continues to be the lone voice arguing that the FOMC should remove the "extended period" phrase, to gradually prepare the markets for the end of free money. The horror! The entire meeting minutes can be read here.